Prominent expounder of the Law and one of the most important liturgical writers of the tenth and eleventh centuries. He was a native of Mayence and a contemporary of R. Gershom Me'or ha-Golah. He received a written communication from Meshullam b. Kalonymus (Zunz, "Literaturgesch." p. 111). Among his pupils were Eleazar b. Isaac, who was a relative of his, and Yaḳar, the father of R. Jacob b. Yaḳar. He is to be distinguished from R. Simeon, Rashi's maternaluncle, since the latter appears to have been a pupil of R. Gershom (comp. Rashi's commentary on Shab. 85b and on 'Er. 42b). R. Simeon the Great had the reputation of being a miracle-worker; and it is said of him in the Vitry Maḥzor (ed. 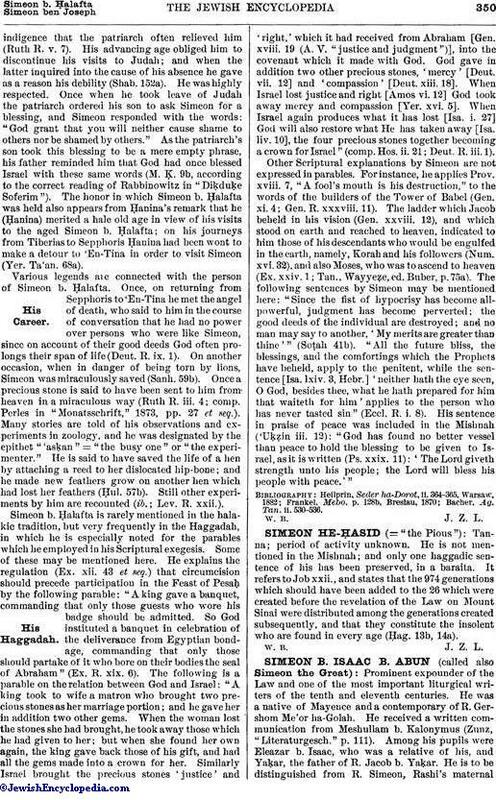 Horowitz, p. 364, Berlin, 1889) and in the "Shibbole ha-Leḳeṭ" (ed. Buber, p. 26) that he possessed great skill as such. An old tradition relates that in his house he had hanging on the wall three wonderful mirrors, in which he could see the past and the future; also that after his death a spring bubbled up at the head of his grave (Jellinek, "B. H." v. 148). He had a son, Elhanan, who, tradition relates, was torn when a child from his parents, was brought up a Christian, and later became pope under the name Andreas. 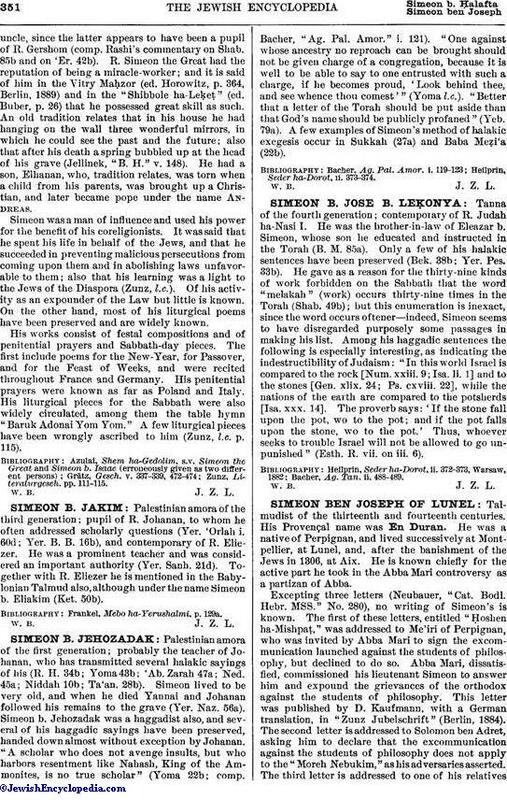 Simeon was a man of influence and used his power for the benefit of his coreligionists. It was said that he spent his life in behalf of the Jews, and that he succeeded in preventing malicious persecutions from coming upon them and in abolishing laws unfavorable to them; also that his learning was a light to the Jews of the Diaspora (Zunz, l.c.). Of his activity as an expounder of the Law but little is known. On the other hand, most of his liturgical poems have been preserved and are widely known. His works consist of festal compositions and of penitential prayers and Sabbath-day pieces. The first include poems for the New-Year, for Passover, and for the Feast of Weeks, and were recited throughout France and Germany. His penitential prayers were known as far as Poland and Italy. His liturgical pieces for the Sabbath were also widely circulated, among them the table hymn "Baruk Adonai Yom Yom." A few liturgical pieces have been wrongly ascribed to him (Zunz, l.c. p. 115). Grätz, Gesch. v. 337-339, 472-474: Zunz, Literaturgesch. pp. 111-115.